Israel's National Security Council (NSC) increased its travel warnings to Tunisia following reports of attacks on Israeli or Jewish targets in the country. 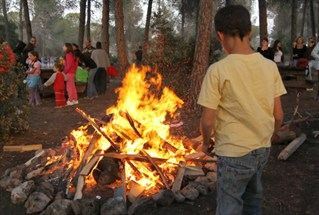 The NSC's Anti-terrorism Bureau said that the danger was particularly great on the island of Djerba, where Israelis have gathered in the past for the Jewish festival of Lag B' Omer, the Jewish holiday that commemorates the death of Shimon Bar Yochai, a second-century rabbinical sage. "In light of an updated situation assessment the Anti-terrorism Bureau has decided to upgrade the existing warning on travel to Tunisia," said a statement by the NSC. The travel advisory has been raised to the second-highest, emphasizing the likely public gathering in Djerba for the Jewish holiday. During the festival, Israelis and Europeans gather at the island's Ghriba synagogue, the oldest in Africa, where they pray and light candles. The pilgrimage attracted a peak number of 10,000 pilgrims in 2000, but was cancelled last year due to the charging political environment caused by the “Arab Spring” and less than 100 made the journey. "We are not afraid of Salafis who talk too much. We're afraid of those who say nothing, then do something," said David Bitan, a Jewish resident of Tunisia. "Things have changed since the revolution. Before, people were afraid of the police. Now, we are under pressure. The police is weak, so racism is increasing." Tunisia's Jewish community once numbered 100,000 people. But fear, poverty and discrimination prompted several waves of emigration after the creation of Israel in 1948. Many left after the Six Day War and went to either Israel or France.